“What are Lay People Who Serve at the Altar Called?" “What Are Lay People Who Serve at the Altar Called?" What is an Extraordinary Minister of Holy Communion? What is the role of lay Ministers in the distribution of Holy Communion? A Eucharistic minister who is not ordained is called an “Extraordinary Minister of Holy Communion.” The ordinary Ministers of Holy Communion are bishops, priests, and deacons—all of whom have received the Sacrament of Holy Orders. The Church does permit the use of Extraordinary Ministers of Holy Communion under certain circumstances. The Catechism, quoting the Code of Canon Law [can. 230 § 3], states: “When the necessity of the Church warrants it and when Ministers are lacking, lay persons … can also … distribute Holy Communion in accord with the prescriptions of law” (no. 903). In 1972, Pope Paul VI revised several ministries and minor clerical orders. One ministry that was preserved was the ministry of the Instituted Acolyte. While the term acolyte is at times used when referring to young men and women who assist at the altar (altar servers), the ministry of Instituted Acolyte is a permanent institution. Because the ministry has its roots in the formation of ordained clergy, the ministry is reserved to men. The Instituted Acolyte is appointed to assist the deacon and serve the priest in the celebration of the liturgy. As of the writing of this article on April 10, 2016, both Peter Pham and Gil Vargas serve as our Instituted Acolytes. bishops, priests, or deacons. If such Ordinary Ministers of Holy Communion are not present, "the priest may call upon Extraordinary Ministers to assist him, i.e., duly instituted acolytes or even other faithful who have been delegated for this purpose. In case of necessity, the priest may also delegate suitable faithful for this single occasion (GIRM 162)." Extraordinary Ministers of Holy Communion should receive sufficient spiritual, theological, and practical preparation to fulfill their role with knowledge and reverence. In all matters they should follow the guidance of the Diocesan Bishop (Norms for the Distribution and Reception of Holy Communion Under Both Kinds for the Dioceses of the United States of America, NDRHC, no. 28). All Extraordinary Ministers of Holy Communion should show the greatest reverence for the Most Holy Eucharist by their demeanor, their attire, and the manner in which they handle the consecrated Body or Blood [ GIRM, 280]." (NDRHC, 29). Serving at St. Therese: Here at St. Therese, we use Extraordinary Minister (E.M.) Communion tags. Fifteen minutes prior to each Mass, each Minister should go to the Sacristy vestibule to sign in and retrieve the assigned tag. If you haven’t picked up your tag before Mass, the Sacristan will give your assignment and tag to another Minister. It is important to arrive early to Mass, be dressed appropriately and modestly—without distracting jewelry or flashy nail polish. You should also be wearing an E.M. tag. Wearing the tag is very important because it keeps the correct number of Extraordinary Ministers. The bigger Masses, such as the Holy Triduum Masses, Confirmation, Ordinations, Christmas, and special Solemnity Masses, use all attending clergy (Ordinary Ministers) and Confirmed Acolytes first. Sometimes the older adult Altar servers are also Ministers so the congregation cannot see the count that the Sacristan is using. Also, in the case of Good Friday, only Hosts are distributed, no Cups. If you are attending one of these larger Masses or see extra Concelebrants, a Bishop, or several priests on the Altar, please see the Sacristan in the back first before going into the Sanctuary as an E.M. If the tags are not hanging in their spots, that’s also an indication that something different may be going on and you should check in with the Sacristan first. After Communion, ciboriums are to be placed only on the Altar, but Communion cups and patens are to be taken into the Marian chapel for purification by a priest or deacon. Any remaining Precious Blood can be consumed by an E.M., but ONLY in the chapel, NEVER in the body of the Church in view of the congregation. If a minister cannot consume remaining Precious Blood, he or she should place the pacificator over the chalice and let the Sacristan know. Liturgy of the Eucharist: As the Agnus Dei or Lamb of God is begun, the Bishop or priest alone, or with the assistance of the deacon, and, if necessary, of concelebrating priests, breaks the Eucharistic Bread. Other empty ciboria or patens are then brought to the altar as necessary. The deacon or priest places the Consecrated Bread in several ciboria or patens, if necessary, as required for the distribution of Holy Communion. If it is not possible to accomplish this distribution in a reasonable time, the celebrant may call upon the assistance of other deacons or concelebrating priests. If Extraordinary Ministers of Holy Communion are required by pastoral need, they should not approach the altar before the priest has received Communion. After the priest has concluded his own Communion, he distributes Communion to the Extraordinary Ministers, assisted by the deacon or concelebrant. After all Extraordinary Ministers of Holy Communion have received the Eucharist, the bishop or priest celebrant reverently hands vessels containing the Body or the Blood of the Lord to the deacons or Extraordinary Ministers who will assist with the distribution of Holy Communion. The deacon may assist the priest in handing the vessels containing the Body and Blood of the Lord to the Extraordinary Ministers of Holy Communion (NDRHC, 40). The proper and only permissible form for distributing Holy Communion is to offer the consecrated Hosts by saying, "The Body of Christ" and to offer the consecrated wine by saying, "The Blood of Christ." No other words or person’s names should be added; and the formula should not be edited in any way (GIRM, 161; 284-287). If a Host or some particle of it falls, it should be picked up reverently by the minister. The Host may be consumed or completely dissolved in water before being poured down the sacrarium. Should there be any mishap, for example, if the consecrated wine is spilled from the chalice, the area should be washed and the water poured into the sacrarium. The sacred vessels are to be purified by the priest, the deacon or an Instituted Acolyte. The amount of wine to be consecrated should be carefully measured before the celebration so that none remains afterward. It is strictly forbidden to pour the Precious Blood into the ground or into the sacrarium. (NDRHC, 51-55). Similarly, "Consecrated Hosts are to be reserved in a ciborium or vessel in sufficient quantity for the needs of the faithful; they are to be frequently renewed and the old hosts properly consumed" (Code of Canon Law, No. 939). Burying Hosts or Consecrated Eucharistic Bread is strictly forbidden. "How Does One Serve as an "Extra-Ordinary" Minister of Holy Communion?" Jesus, always keep me aware and in awe of this sacred mission. Jesus, make me worthy of this great ministry I have humbly accepted. Jesus, send me out into the world to distribute your Love. Amen. clergy to distribute the Eucharist in a timely and orderly manner, the laity are assigned as EXTRA-ORDINARY Ministers. We, as the laity who serve at the altar, must be careful that we do not refer to ourselves as Ordinary Ministers as that is the title reserved only for Clergy. In 1978 the Bishops of the United States voted to extend permission for the congregation to receive the Eucharist under both species—the Bread and the Wine—at Sunday and Holy Day Masses. This welcomed change has increased the need for “Extra-Ordinary Ministers” in the sharing of Communion. I have been privileged to have been a part of this ministry for over twenty years. I feel extremely blessed to share in this ministry because God unites the Extraordinary Ministers of the Eucharist to the members of the Congregation, into the Body of Christ through our Baptism. When the Minister says, “The Body of Christ” or “The Blood of Christ,” our proper response should be, “AMEN,” which literally means, “I BELIEVE!” or “SO BE IT!”. As an Extraordinary Minister, it saddens me when members of the congregation do not respond with AMEN. This is why you have come to this celebration, not to socialize with the Extraordinary Minister standing in front of you, but to give full honor and glory to Our Lord in His Precious Body and Blood. We are to treat Our Lord’s Body and Blood with dignity and respect, as it truly is His Body and Blood. 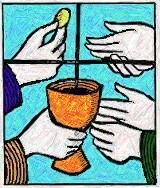 Holy Communion is the gift of receiving the Lord Jesus. You are not given a wafer to handle as you would a cookie or to chew as a piece of gum! No! It is the Body, Blood, Soul, and Divinity of Jesus Christ! The Cup from which you sip contains the Consecrated Blood of Christ Crucified. His Blood is NOT a “terrible-tasting wine”—as one of our parishioners says on a regular basis! Scandalous! The Eucharist is the Real Presence of our Crucified Lord and Savior. After receiving Holy Communion and returning to your pew, kneel down to say prayers of Thanksgiving. One should certainly not leave church immediately after receiving! Jesus Christ has given us so much in this Eucharistic Celebration that we should give Him our utmost respect and love before, during, and after our reception of Holy Communion. A = Adore; L = Love; T = Thank; A = Ask; R = Resolve. This will help to remember to tell God how and why you Adore and Love Him; to Thank Him for His gifts and graces and express gratitude for His life on earth and for His Passion, Death, and Resurrection, etc. ; to Ask Him for whatever you need; and to tell Him that you Resolve to follow Him and obey Him, etc. This prayer form is especially useful if you are feeling distracted or preoccupied.